My mom and I were really good friends. 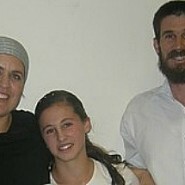 I am the oldest child, and until Hadas was born I was also the only daughter. All of my friends had problems with their parents, and I was the only one who was different. Eema and I would go walking every evening and I would tell Eema things about myself. One evening we went out on a walk; it was winter and very cold. I had two friends and we were sort of a trio together, but at one point we had started to fight. Eema told me, “Friendships never work as trios.” It started to rain and we ran together. We got home soaking wet and laughing. They real loved when we would get wild all together, and that’s how our Friday night tradition got started. Every Shabbat, already in the middle of the meal, the little kids would go to the room, and they would take blankets and pillows out to the living room and start to get wild, until everyone would fall asleep in the living room. On Friday night there was a terror attack. My brothers were sleeping in the living room when two terrorists came into our home. When I came home already nothing was as it had been before. My Abba and Eema were murdered with three of my younger siblings, and since then I have a hundredth of a second of an image that I will never be able to forget. Today I think my father knew something about me which can give me so much strength. The words of my Eema and Abba can continue within me forever. Hashem Yinkom Damam. A tremendous young woman who I will always have in my thoughts. So moving, sad and triumphant all at the same time. Her parents would be so proud of her! Most wonderful last message ever. Thank you. Tamar, you are a beautiful writer and your words are inspirational. Well here’s an only in Israel story to add to this. Before Pesach we were at a Yarid (fair) to sell our modest swimwear – the fair was in TelAviv for 3 days then in Jerusalem for 3 days. We were driving back and forth to J’lem and one vendor there asked us for a lift as she didnt want to drive herself at nite. So we gave here a lift back and forth (she lived in Arnona) On the last day to Tel Aviv, as we stopped for gas, we played Jewish geography (she spoke English). Her family was Teminy (I think) but her husband was American. Then she asked me … did I know or heard of the Fogel family … (I thot to myself, not the ones from Itamar) and she verbalized it for me that her sister was Rut — I stopped breathing – tears came to my eyes – I turned around and said to her chokingly that “it … was … an … honour… to have you in our car..” I didnt know what else to say. She proceded to tell me that her and her husband had to leave their Yeshuv to move to Arnona to be close to her parents …. who were now raising the surviving children. I later met the 14 yr old Tamar – she had come to help at the J’lem Yarid – This week we were at another J’lem Yarid and Tehilla was there – I told her to pick something from our Lacey Shells for Tamar as a gift – I just wanted to do something. We should only know health and happiness and prosperity and peace in the coming year!!! So much tragedy for a little girl to face. May G-d bless you and your family fron now on. Powerful story. I lived two doors down on Leeb Yafeh from Tamar’s grand parents. Everyday and every night after the massacre I would mourn with the hundreds that would visit. I was on duty with my Border Police unit the night the Yeshiva students were murdered, I participated in filling the houses of both tractor terrorists with concrete, I served in the North and South during two wars…but to this day I have never been more affected by the loss of family than the Fogels. Tamar, your reflections give all of us strength.